Tundrite… Hansel’s making words again. This one means something like frozen water crystals. I.e. ice or snow. So just to be clear…they’re speaking of Snow White and Rose Red, and how that story is messing up the Snow White and the seven drawfs story, right ? I mean I can’t think of another tale or two that has a similar name, right ? Still if I’m right, then I’m confused with how those two stories and the book by Hitler crash together to make up this sinful adventure ? Maybe it’s perfection that is the greatest weakness of man/woman to achieve ? You are correct. Snow White/Rose Red was previously mashed up with Rumplestiltskin for the “Rumpled Snow” arc they are talking about. 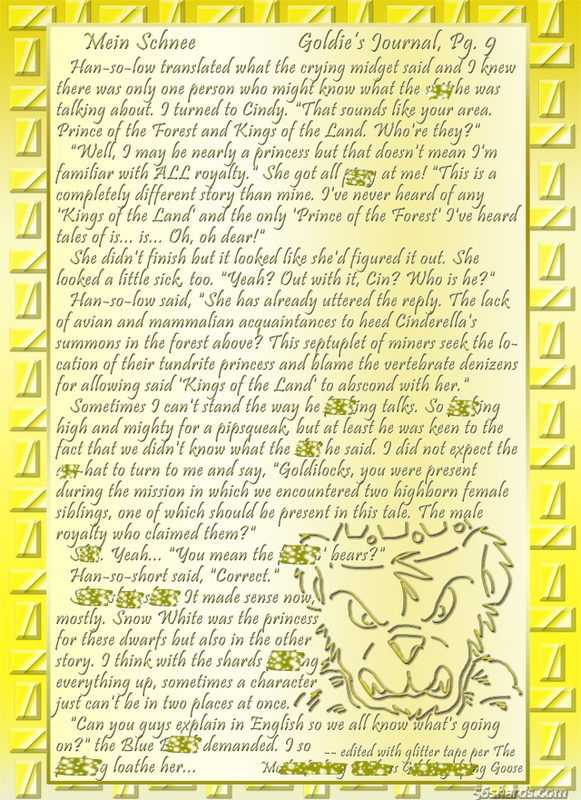 This tale combines Snow White and the Seven Dwarfs, Mein Kampf… and the “Prince of the Forest”. You can think of it as the dwarfs are stuck here without their princess and their story has gone to heck, because she’s stuck in another story of similar name with her that-story sister. Duality, plurality, and common themes are huge here at SHARDS and it’s only going to get worse :) The Snow White/Rose Red/Rumplestiltskin and Mein Kampf are not crossed together here. They are separate. The only thing connecting them is the dual hell the dwarfs and critters are going through due to the absence of their princess who is currently in another story and not existing in both as she should be doing.